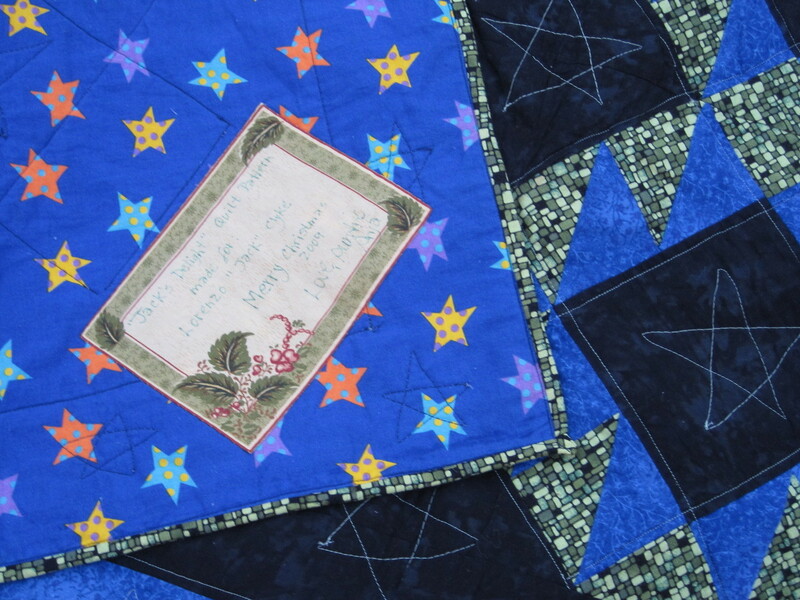 My November ALYOF goal was to piece my Night Sky quilt top. Goal achieved!!! I finished up late last night but had to wait until today to get a photo. Night Sky was easy to piece, but it took some time. 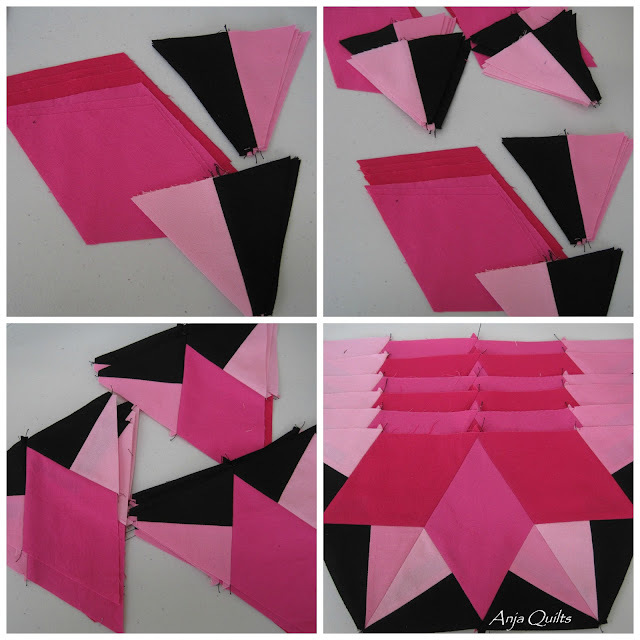 Half triangles were sewn together and then sewn to the diamonds. This created a triangle, and three triangles were pieced to make a half hexagon. 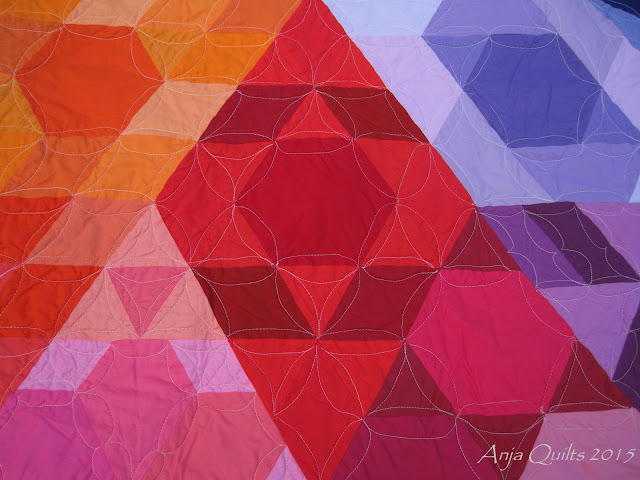 Although the pieces become full hexagons in the quilt top, they are pieced together as half hexagons for easy piecing. It was a tad windy trying to take a photo. Now the difficult decision...how to quilt this (and thread colour). Your suggestions are appreciated. Linking up with the ALYOF November finishes link up. Stop by to see all the goals that were achieved this month. You may recall this WIP from last month. I had no ideas on how to quilt it. My MMQG mates provided some suggestions. It's hard to tell from the photo, but I did swirl FMQ in white. I thought the white would stand it, but it didn't. And with the change of season, it's difficult to get good photos. It's dark in the morning before work, and it's dark when I get home from work. Oh spring...where are you?? Here's a closeup of the quilting. 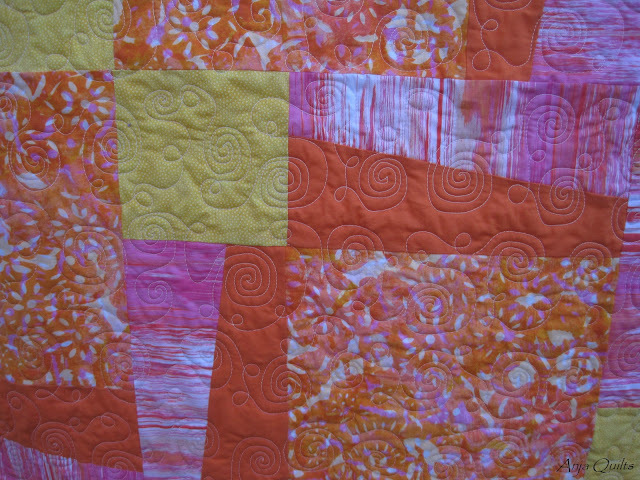 I've decided swirl FMQ is not a favourite of mine. 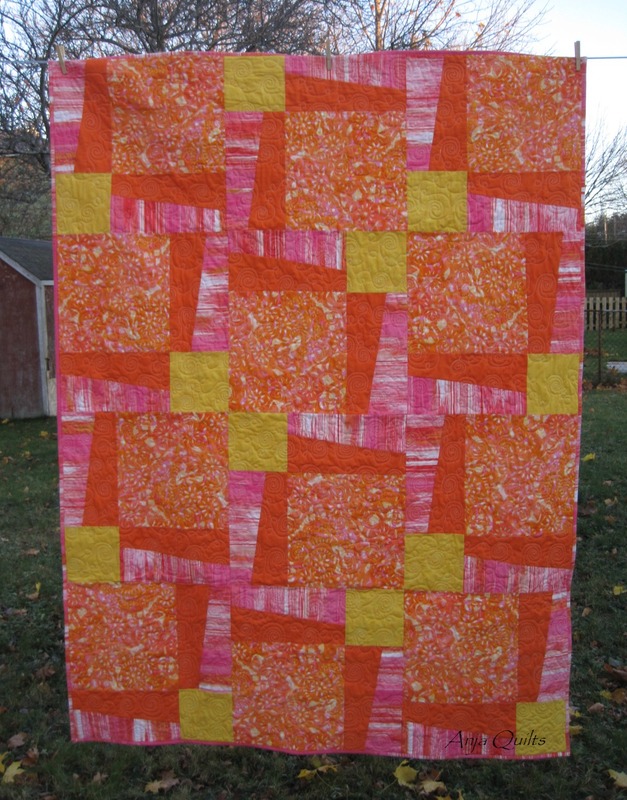 This quilt may not have turned out as I had envisioned, but it's going to charity, so it will be loved by someone. 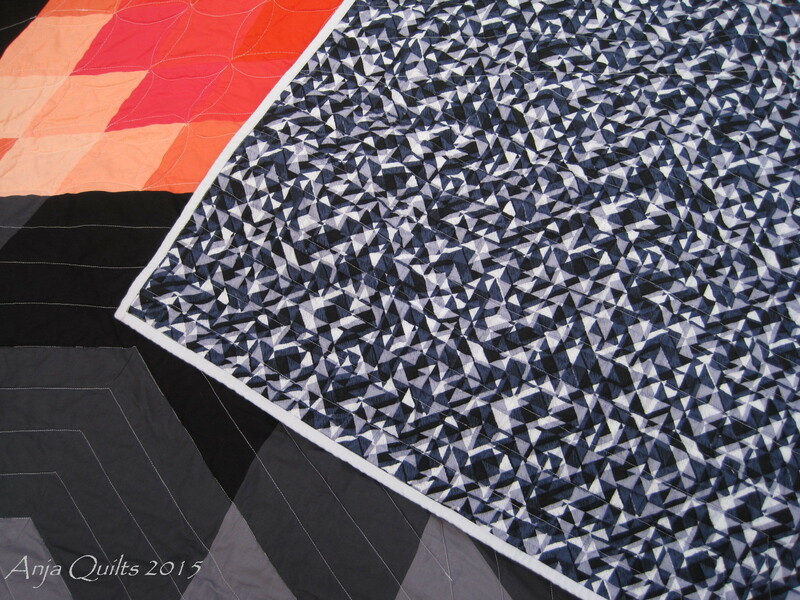 And so the fascination with patterns by Jaybird Quilts continues...here is Delight. No Kona solids today, but rather two fat quarter collections from the Bargain Lover's Club by Sew Sisters Quilt Shop. 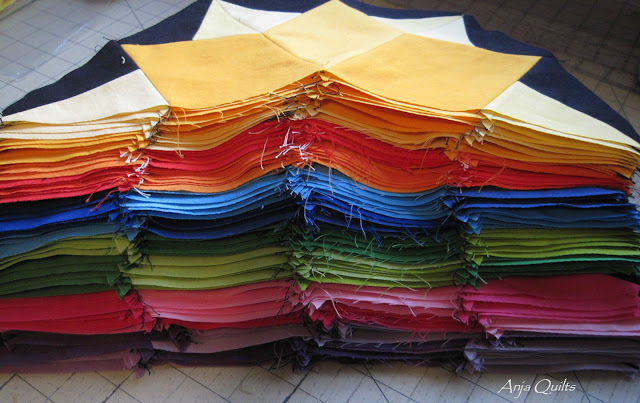 The patterns often look difficult, until you look inside and see how the pieces are sewn together. 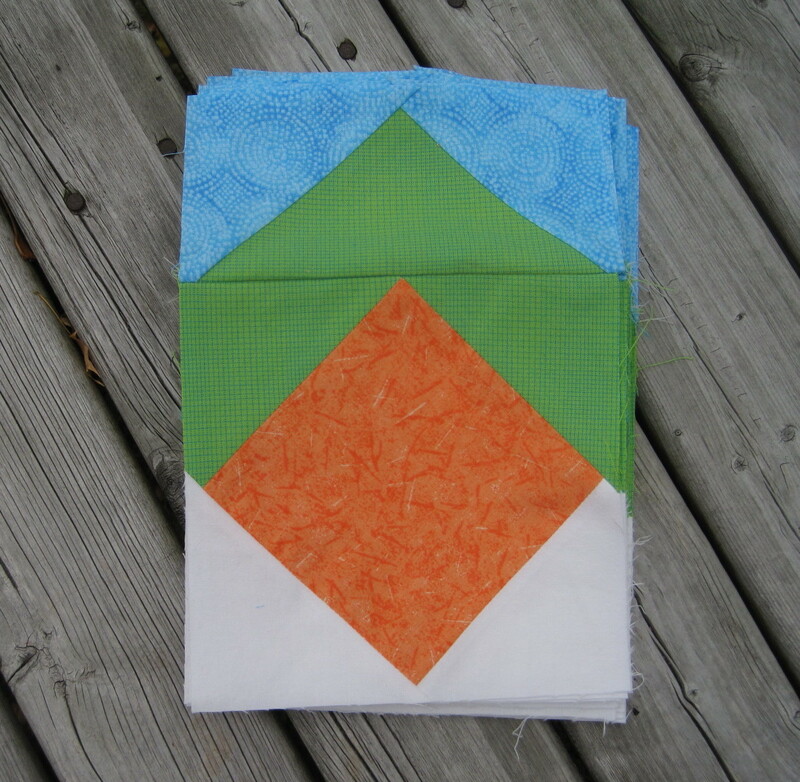 The Hex N More ruler is an awesome tool, and I also use it for non-Jaybird patterns. You'll see that the low volume hexagon is actually six triangles made from two different fabrics. 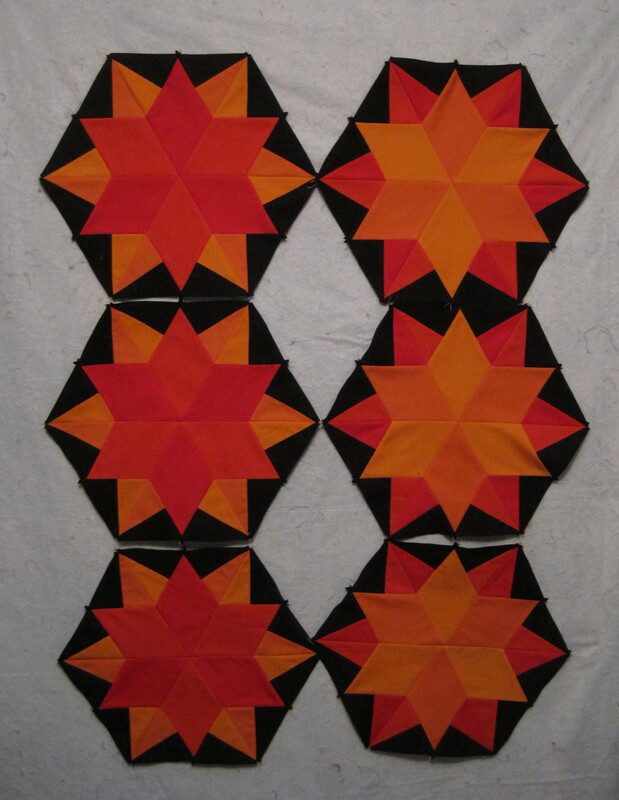 But the triangles are sewn to the print hexagons. The top is then pieced in columns -- no Y seams! I'm unsure how to quilt this, but I think maybe I'll try loop FMQ. 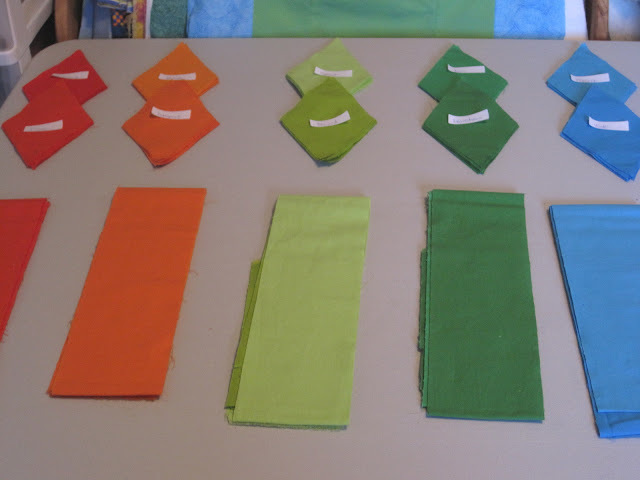 Life has been busy the last several weeks, but there has been some sewing happening. 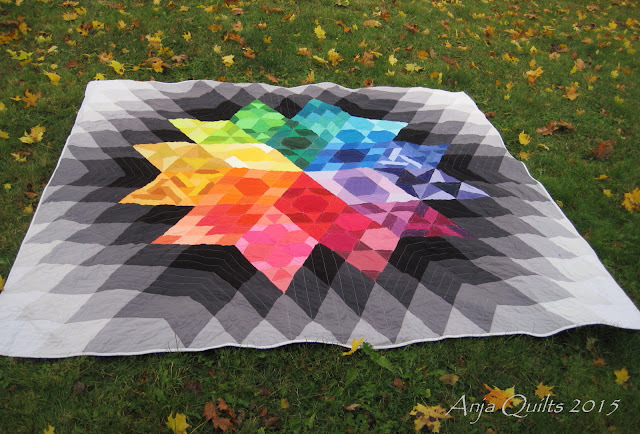 This is my version of Glimmer by Jaybird Quilts. I clearly need to do a better job with ironing. 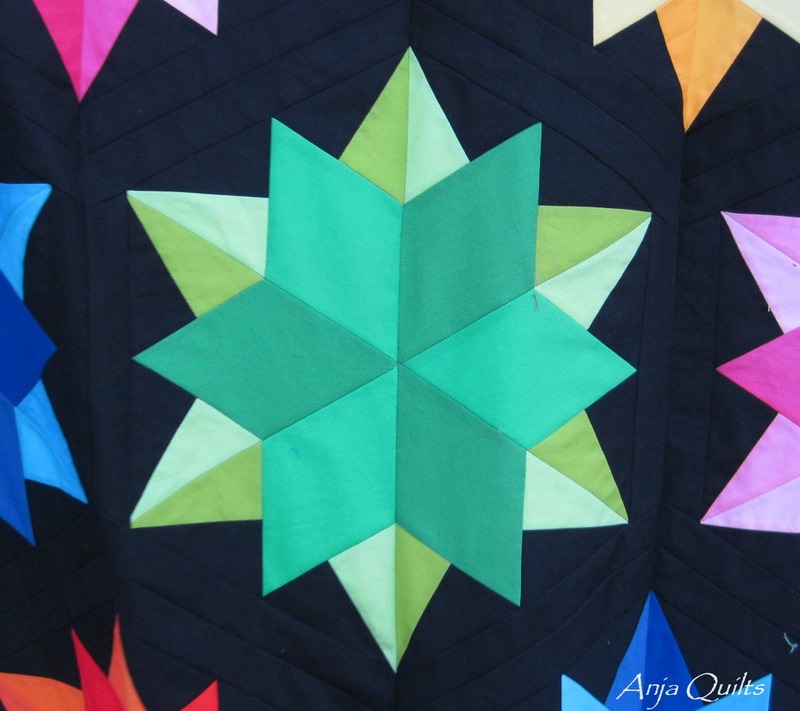 My plan is to quilt an overall motif of FMQ stars. Sew day with the Squares!! 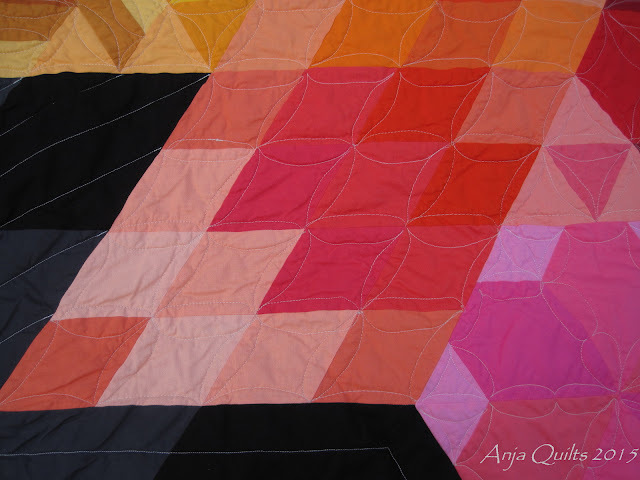 My quilt bee Q-Squared managed to find a day that we were all available. It's been a busy two weeks at work that I haven't done any sewing, and it will continue to be busy for the next few weeks. It was so good to get together with friends today. Even though I had a million things to do at home and at work, it was necessary for my sanity. 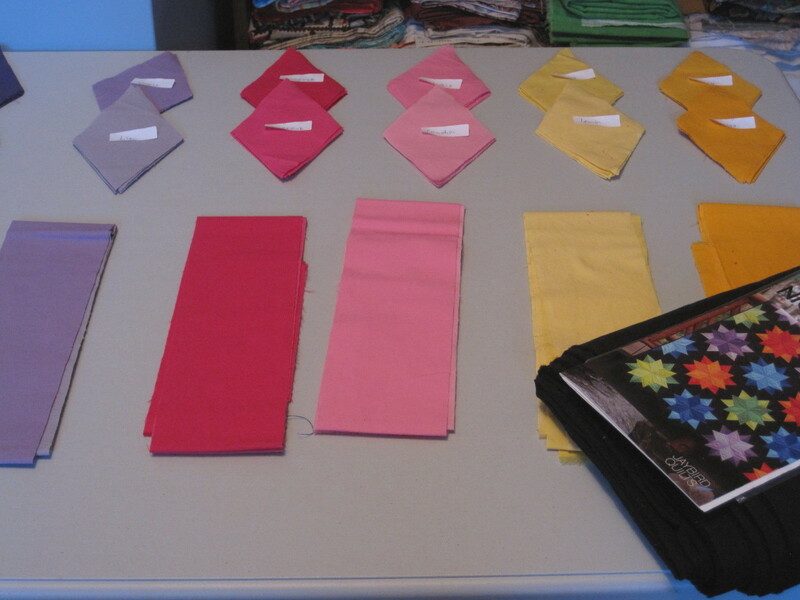 I started the day working on the November instructions for the Mystery Quilt hosted by Meadow Mist Designs. 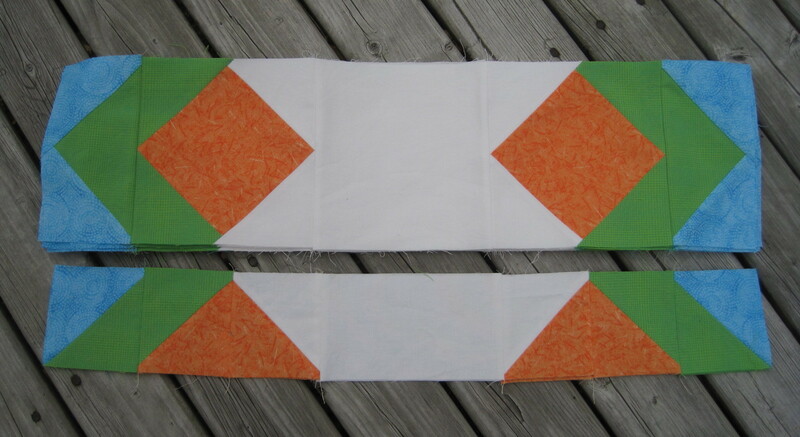 The flying geese were sewn to the square-in-square blocks. I managed to finish all of November's instructions. Looking forward to December's instructions. There are no loose pieces left, so I guess we begin piecing the top in December. These are the Court House step blocks from October. I also started piecing my Night Sky quilt which is my November ALYOF goal. And then I discovered that I wasn't suppose to piece the blocks together -- they were meant to be left in halves for easy piecing of the top. Sigh...... I couldn't bear to unstitch them tonight -- I'll save that for another day. 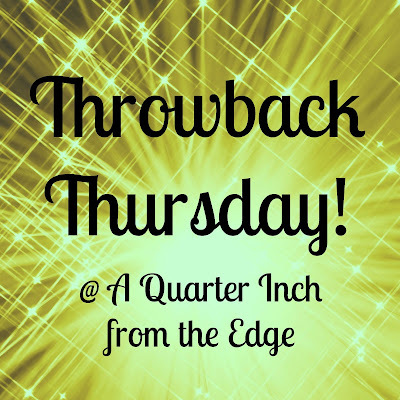 It's time for another Throwback Thursday hosted by Jenn @ A Quarter Inch From the Edge. 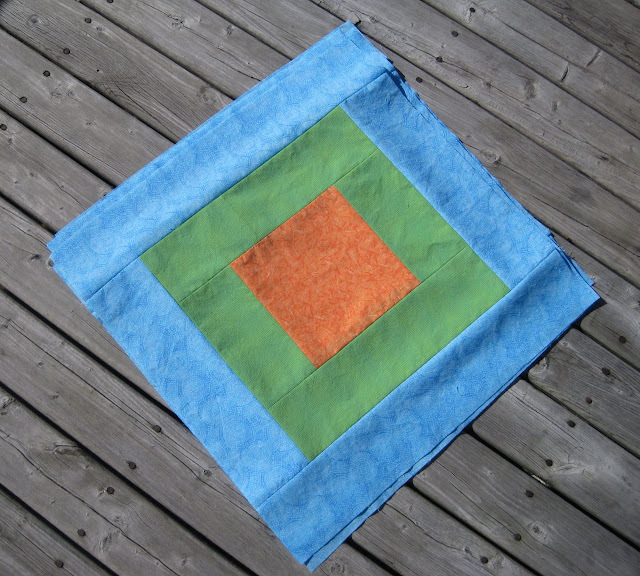 Today's quilt is another one from the nephew collection. Didn't realize just how many quilts I made for him. 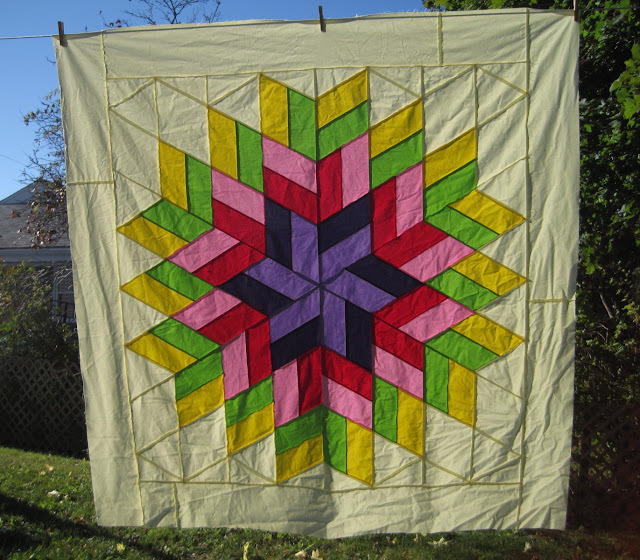 The pattern, Jack's Delight, was found over at Delaware Quilts. Unfortunately, the block is no longer showing in list of blocks. I choose this pattern as my nephew's nickname is Jack. Here's a close up showing my first attempt at star FMQ. Not bad if I do say so myself. I wish had bought more of this green/black print. The label says this was a gift for Christmas 2009. 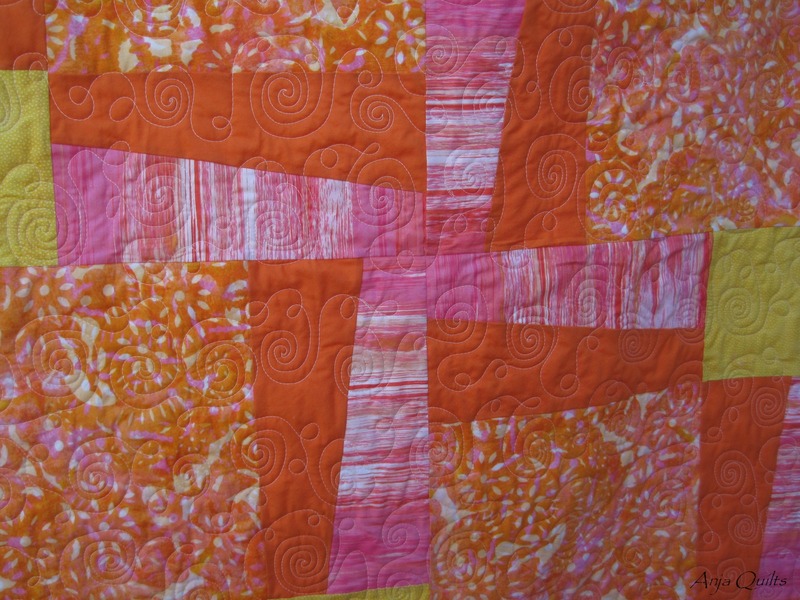 Head over to showcase your Throwback Thursday quilt and to see some other quilts from the past. 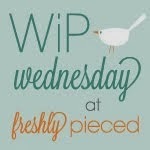 Today's WIP is another A Lovely Year of Finishes goal. November's goal is to piece the top for my Night Sky. 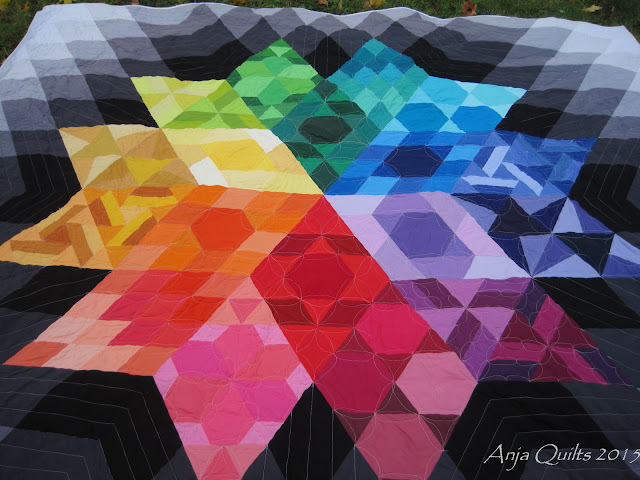 Originally, I thought I'd be ambitious and have the entire quilt finished by the end of the month, but upon reflection, I realize that is not likely possible. I started cutting the pieces some time ago, but stopped when I realized that I needed space to lay everything out. 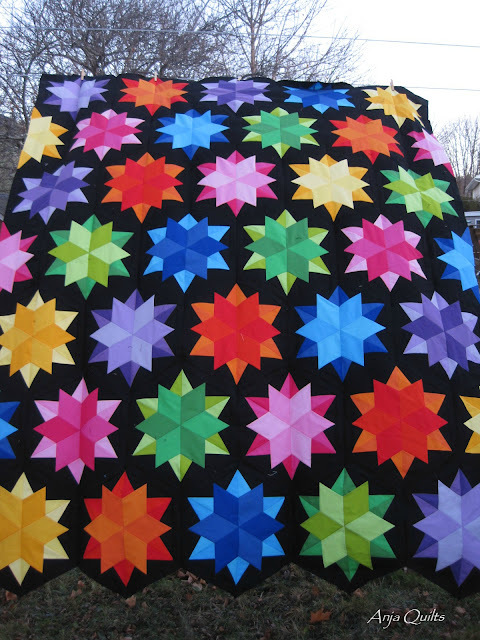 There are 24 Kona colours in this quilt. So I set up a folding table in my sewing room this week. It's a tight squeeze with very little room to move around, but hopefully that will give me the motivation to get this done quickly.